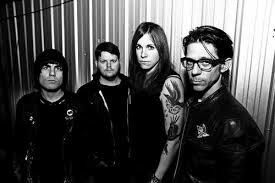 Gainesville, Florida rockers Against Me! are currently on tour with Frnkiero andthe Cellabration and Annie Girl and the Flight. Their latest album Transgender Dysphoria Blues was released in the beginning of 2014. This album explores singer Laura Jane Grace's journey as a transgender individual. Laura announced her transition in 2012 and documented her personal journey in a documentary called True Trans: Laura Jane Grace. Her story is pretty inspiring, it will be wonderful to finally watch her preform as her true self at St. Andrew's Hall in Detroit this Friday, June 26th. Tickets for the show are $20 and they can be purchased here. We also have two pairs of tickets to give away to the show thanks to our friends over at Live Nation Detroit. If you would like to enter to win a pair, please email your full name to hipindetroit@gmail.com with the subject line #againstme! We will draw two winners the day before the show and we will email them details on how to claim their prize. To learn more about transgender visit Glaad's website here.